Despite all logic, the Dodgers actually kept pace with the Cubs for the entire duration Jon Lester was in the game, as Brock Stewart had the start of his life against the best team in the majors. And after that, they won the battle of the bullpens (sorta) on a fluke play to net a single run, giving the Dodgers the 1-0 victory and series win. I would like to give credit to myself for being so negative about this matchup, and thus obviously powering the Dodgers to the win. You’re welcome. Brock Stewart has been terrible to start his MLB career, there’s no way around that. Of course, that didn’t stop him from throwing five innings of shutout ball today, surrendering just two hits and two walks. Stewart was dominant for a lot of the game, striking out eight (including six in a row at one point), and in particular his change was working to both righties and lefties. His fine command is still off and on, but the adjustments made were effective and he showed today exactly why many think he can fit in the middle of a rotation eventually. The curious part was that Stewart went just 80 pitches before he was pinch-hit for. While I agree that Stewart probably would’ve only lasted another inning, and it was the third time through the order with 2-3-4 due up for the Cubs, I’m not sure who else would’ve been a better matchup other than Kenley Jansen. Maybe I could’ve understood the choice more had there been a scoring chance, but a runner on first and two outs is not exactly a pressing situation where one needs to put in struggling Josh Reddick against a front-line lefty (which Reddick doesn’t hit well anyway). Furthermore, with the platoon lineup out there, the opportunities to double switch weren’t exactly going to be few and far between. Anyway, Jesse Chavez entered to get the sixth and promptly gave up a lead-off double. Chavez also walked a batter, but did get two outs before being removed for a lefty-lefty matchup and Grant Dayton. 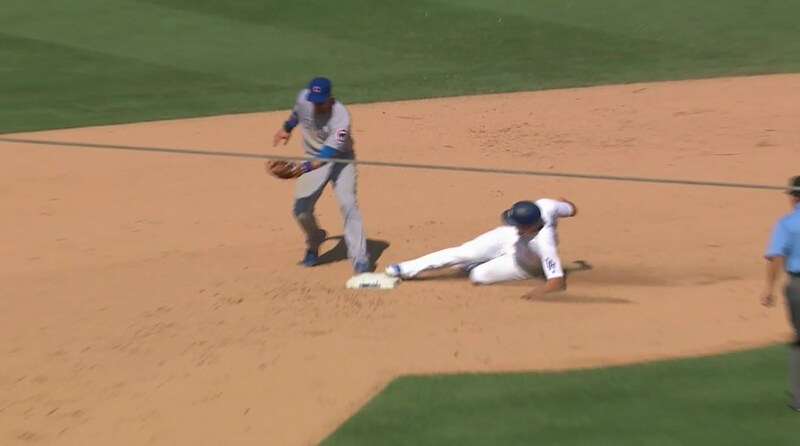 Dayton escaped the inning, though not due to his own part as he gave up an absolutely smoked ball to Adrian Gonzalez, who made the play for the out. Dayton continued on in the seventh, getting a scoreless inning, and he ended his day with just a walk surrendered. 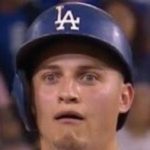 Joe Blanton was the man in the eighth inning, and he immediately induced a high fly, but Joc Pederson got a terrible read on it in center and it fell in front of him as he charged in after it. Blanton then induced two more fly balls for outs, with the last one being another defensive adventure, this time between Corey Seager and Charlie Culberson. As for the other side of things, Jon Lester was about as dominant as everybody expected, going six shutout and only allowing three hits and two walks. As a whole, the offense only mustered four singles and three walks while striking out 12 times, but they did scratch across the run that mattered. With one out in the eighth, Andrew Toles was hit on the foot by a curve. Howie Kendrick grounded back to the pitcher, which seemed to serve as a sac bunt at least, but the ball was thrown away down the right-field line and that put runners on second and third. Seager was then intentionally walked, which set things up for Justin Turner. Turner struck out on four pitches, making everybody rip their hair out, and A-Gon grounded out to third to end the inning in bitter disappointment … or so it seemed before Seager was ruled safe at second. 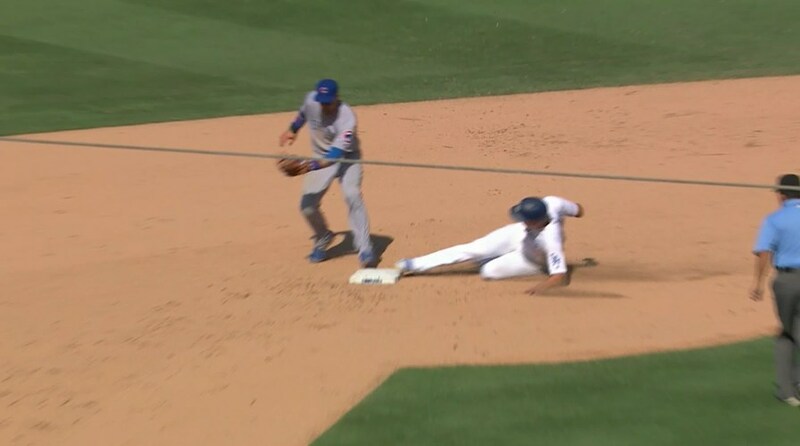 Ben Zobrist was late covering the bag due to the shift, and Seager’s foot beat his foot. Barely. After being upheld on review, the Dodgers took the 1-0 lead. That left things up to Kenley Jansen for the third consecutive game. Jansen got a fly out to start the frame, then got a grounder into the hole which relied on a nice play from Corey and a nice play on a long hop from A-Gon to record the out. The game was capped off with an exclamation point as Jansen notched the strikeout. With the win, the Dodgers improve to 73-57 on the year and 42-26 at home. The Giants won in a blowout, so the Dodgers lead in the NL West is still two games. In the most crucial stretch of the season, the Dodgers went 4-2 against the Giants and Cubs, which bodes well going forward. That said, the problem with the Dodgers has been not winning games they’re supposed to win, and nobody’s gonna be happy unless they can take advantage of the upcoming series against the Rockies, Padres, and Diamondbacks. I totally expected them to win, you guys. The Dodgers start off the aforementioned section of their schedule by travelling to Satan Field to play the Rockies at 2:40 PM HST/5:40 PM PST/8:40 PM EST, with you’re-the-ace-now-bro Kenta Maeda (3.37 ERA/3.72 FIP/4.17 DRA) against better-than-it-seems Jon Gray (4.61/3.76/3.52) as the pitching matchup. In late roster news, Shawn Zarraga has been outrighted off the 40-man roster.